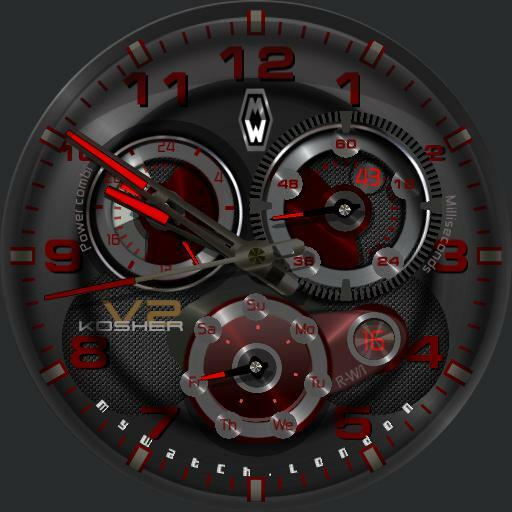 Mywatch.london has gone to town creating the Kosher V2, pure and suitable for the task. The kosher range looks so realistic it will confuse smartwatch admirers, I love the depth perception, shadowing and vibrant colours overlaid onto brushed aluminium. The Kosher face has three sub-dials, 24-hour, phone battery consumption, millisecond/seconds, month and day. The Kosher face has a unique realistic reflection shadowing and shine effect that will leave you speechless. Overall the Kosher range is beautifully designed to be easy to read at a glance and to look fantastically sharp on any smartwatch. A must have face for smartwatch lovers.